Italian architect; b. October 1, 1507; d. July 7, 1573. Giacomo was the oldest son of one Clemente Barozzio of Milan, who, forced to leave that city by political disturbances, settled at the village of Vignola near Modena, Italy. He went to Bologna to study painting, and later turned his attention to architecture. About 1535 he went to Rome. Vignola was commissioned by Primaticcio, who visited Rome in 1539-1540, to superintend the casting of antique statues for Francois I of France. A visit to France about this time was not productive of any important results. Returning to Rome, he was charged by the Vitruvian Academy, which was founded in 1542 by Marcellus Cervinus (afterward Pope for twenty-one days as Marcellus II), Bernardino Maffei (afterward cardinal), Alessandro Manzuola, and others, including probably Michelangelo, with the investigation and measurement of the Roman monuments. He was about this time much occupied with important works at Bologna. Gaye publishes a long letter from Vignola to the officials of the Church of S. Petronio at Bologna defending the design which he had made for the facade of that church. (The facade was never built.) He made the canal at Bologna at this time, and designed the fine Palazzo Isolani at Minerbio (now destroyed). The famous Portico dei Banchi at Bologna was built by him later, in the pontificate of Pius IV (Pope 1559-1565). 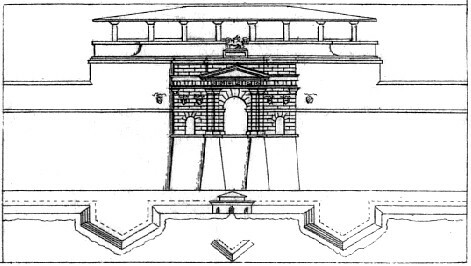 Vignola was made chief architect of Julius III (Pope 1550-1555) and directed the reconstruction of the aqueduct called Aqua Virgo at Rome (built 48 B.C.). He also built at the Villa di Papa Giulio at Rome the larger casino with the semicircular colonnade. For Alessandro Farnese, second cardinal of that name, he built the great pentagonal palace of Caprarola, seven miles southeast of Viterbo, Italy (begun 1547, finished 1559), the famous church at Rome called del Gesù, and laid out the Farnese gardens on the Palatine Hill. The fine gateway which he built for these gardens was removed for the recent excavations in the Forum. For Ottavio Farnese (1520-1585) Vignola planned the ducal palace of Piacenza, now nearly destroyed. He is supposed to have been employed by Michelangelo Buonarroti, and some of the characteristics of that artist's work as architect are ascribed to Vignola. Charles Garnier ascribes the cornice of the Farnese Palace to Vignola. He built the Porta del Popolo in Rome. In 1564 he succeeded Michelangelo as architect of S. Peter's. He composed two books: the Regola delli cinque ordini d'architettura (1563), still the standard text-book of the French schools, and Le due Regole della Prospettica Pratica, published by Ignatio Danti after his death in 1583. Vignola had a large professional practice. A partial list of his buildings is published in the Architectural Publication Society's Dictionary. The Œuvres complets de Vignole, ed. Lebas and Debret, was published in Paris in 1815.
painter and sculptor; b. 1509; d. 1566. Ricciarelli was influenced by Sodoma, Peruzzi, Perino del Vaga, and Michelangelo. He was a laborious painter and left many pictures in the Roman churches. The most important is the Descent from the Cross in the church of S. Trinita del Monte, supposed to have been designed by Michelangelo. He assisted Michelangelo in much of his work. Gate called La Porta-nuovo, built by San Micheli, from 1533 to 1535.